For those who don’t know what Kickstarter is, it’s a website in which people can present a business they would like to start or a product they would like to sell and ask for investors. Other people can help fund products or businesses they are interested in by donating money, and many of these have been successful. With that out of the way, it’s time for the first Kickstarter of the week. Dice have been around for as long as 5,000 years, but never have they looked like this. 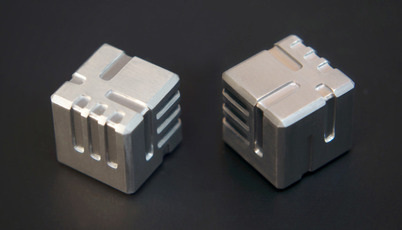 AKO Dice are sleek, space age dice inspired by new age concepts. AKO Dice improve upon the original design for a trendy, one-of-a-kind design, perfect for gamers and collectors alike. AKO Dice utilize a redesigned dice pip with custom engraved artwork on 16 mm 6-faced dice. Instead of traditional pips, each number (1-6) is represented by a line on each side, each of which connects to another side and creating links between numbers. The Kickstarter campaign is a way for people to spread their ideas for cool new inventions and business ideas. The AKO Dice are a great example of how business ideas become a reality. So, head over to Kickstarter if you want to support the future of innovation. Funding for AKO Dice ends on March 2, 2015, so be sure to check out AKO Dice and help the creator, Kacha, by donating here. The AKO Dice was successfully funded, vastly outpacing their $5000 funding goal by over $160,000 from over 6,500 backers.